Ewes can recognize their young by odor, visual appearance, or characteristic vocalizations. However, ewes are reluctant to accept and care for alien lambs, as they will mother only those young that smell like their own offspring. 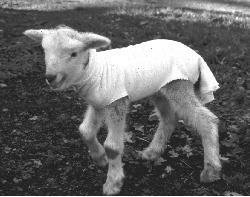 In a series of studies, nylon “Stretchtex” orthopedic stockinettes were fitted to a ewe’s lamb and worn for about 48 hours before transferring them to alien lambs. Of lambs tested, 88% of alien lambs that received transferred stockinettes were successfully adopted. In summary, odor transfer represents a relatively rapid, safe, and inexpensive way to substitute alien lambs for natural lambs. This technique, which saves lambs and increases profitability for sheep producers, has been adopted not only within the U.S. but also in countries such as Australia and New Zealand. 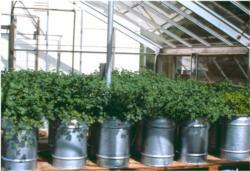 As a result of early research at Hopland and at UC Davis, by the late 1980s many Australian annual legume cultivars (varieties) were being introduced and marketed for improving California annual rangelands. However, none had been systematically field tested in California. Research begun in 1990 revealed that only the subclovers (Trifolium subterraneum) and rose clovers (T. hirtum) were well adapted to the Center’s diverse sites, with the medics, sweetvetch, cup, crimson, and arrowleaf clovers were seen to decline within a few years and many completely disappeared within 6 years following initial seeding. Based on long-term (10-year) results, it is recommended that seed mixes for dryland range improvement include imported subclover varieties Woogenellup, Karridale, Junee, Leura, Gosse, Denmark, Dalkeith, and Losa, and the rose clovers Hykon, Wilton, and Monte Frio. Fertilization with phosphorus and sulfur is needed for optimum results, which often can increase pasture productivity from 3 to 12 times that of unimproved pastures in terms of lamb and sheep productivity.